Although a relative newcomer to the voice-acting industry, David has been active in the performing arts for over 20 years as a stage actor, director, and currently as a storyteller. He has written and performed narration for video tutorials, performed in radio dramas, and has won awards for his storytelling performances. You can also check the Media section to see and hear some of the stories he has performed. In this video, I wrote and narrated the script. You can read the full-story behind it here. In April of 2012, he was the voice actor for Loto-Québec’s training video for Mise-o-Jeu. You can watch the training video here: Mise-o-Jeu Demo. 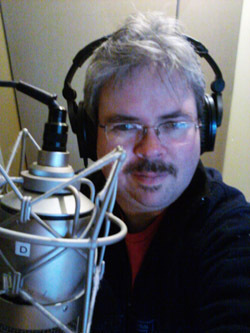 This page is dedicated to Jean-David Perron who is a sound engineer at Studio La Majeure who recorded David for the Loto-Québec training gig and has generously supported him in developing his opportunities as a voice actor. The theory is that the two lads bonded over having the same first names, but that has never been confirmed.